From the director of Freaky Friday and Mean Girls, and the producer of Gulliver’s Travels and the Garfield franchise, MR. POPPER’S PENGUINS will be available on December 6, 2011 on Blu-ray, DVD, digital download and a limited edition MR. POPPER’S PENGUINS gift pack that includes the DVD and TY Beanie Plush Penguin – perfect gift for the holiday! The Blu-ray and DVD also feature a never-before-seen animated short, “Nimrod & Stinky’s Antartic Adventure,” in which Zookeeper Nat Jones flies to the antarctic determined to get Popper's Penguins back. The penguins, led by Nimrod and Stinky, outsmart him once again. We haven't seen this movie yet but it looks good! It'd be a great xmas gift. Would love to share with my younger siblings! We are great Jim Carrey fans and love funny movies. I think the grand-kids will like this one! I would love to win because I have never seen it and neither have my kids so I think it would make a perfect Christmas gift. cause it really looks like a fun movie and i know my kids would love it. I'd like to win because we haven't seen the movie yet but have heard it's very good. One of my four year old twins is obsessed with penguins lately! I want to win it to give it to him at Christmas! Thanks for the chance! I would love to win because I think my son would like it. 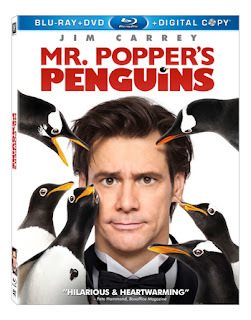 I would like to win this DVD because I am a big Jim Carrey fan. Thanks for the chance. I want to win it for my husband. He likes Jim Carrey movies. We actually haven't seen the movie yet but we LOVE Penguins...oh yeah, and Jim C. too!!! I would like to win to watch this with my family.. Took my son to see this movie in the theaters, he loved it!! Would love to add it do his DVD collection! Trail said just last night that he wanted this movie. We haven't seen it yet. Who doesn't love Jim Carey. Looks like a great movie. I like to win because Jim Carrey is my favorite actor. Would love to win because my son LOVES penguins and we haven't seen this yet! It's a beloved children's book that we haven't seen the movie for. My kids would just love it. I would love to win because Jim carrey is hillarious!! I am interested to see this. We have five kids, and they have really been wanting this movie!